I have two new sparring videos taken during the last gi class on Friday to give you some more ideas on how sparrings look like in BJJ. The first video is me against a senior blue belt and the second one against a fairly new white belt who has been training for about a month. This was the first free roll session after the class was over and I partnered up with a blue belt. He is around 24 kilograms heavier than me and I only free rolled with him once before this. It was around one year ago when I had just been training for a couple of weeks. I remember how he really demolished, smashed and submitted me dozens of times in just a couple of minutes of free rolling back then. This free roll session was supposed to last for five minutes at the most but the cam-person forgot to pay attention to the timer so we rolled for around seven minutes and we both gassed out. As usual, I used the half guard a lot either to sweep my opponent or defend against his pressure from top. The roll looked slow but in reality, there were a lot of grip fighting going on when we were in each other’s half guard that was not visible. There was a point where my opponent tried to sneak in a guillotine choke with my own collar and I had to be really careful to position my body in the right angle to prevent it from actually locked in. I entered total defensive mode in the last half of the round because my opponent managed to secure a back mount. He attempted a lot of chokes and possible setting up an arm-bar from the back but I kept everything tight to survive without getting submitted until the end. After the first roll, I rolled with a couple more blue belts, including a national athlete, so in the final roll, I decided to practice some offense with a fellow white belt. He has been practicing for only a month and I think a roll with him can benefit the both of us. He can learn how to defend properly while not being completely smashed and I can practice some attacks. I tried to shoot for the half guard again put he stepped right into a single leg X-guard instead. 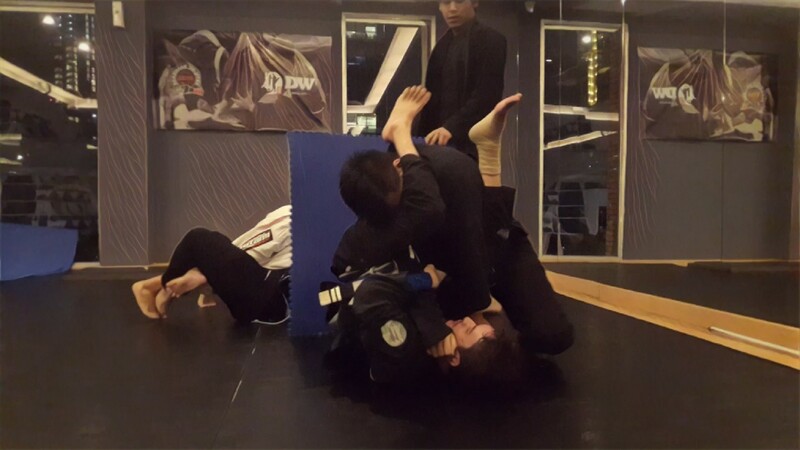 I knew his heel was exposed and I was very, very tempted to lock the heel hook but I had no idea whether he was familiar with the submission or not, so in order to not injure him, I swept him instead and obtain top position. I ended up in his half guard and I managed to pass it to the mount position. He had improved a lot for not panicking under the mount and reverse it making me entering the half guard position. From here on, it looked like as if I was being dominated but actually, I was conserving energy until I thought it was the right time to go for the submission. My opponent spent so much energy trying to discomfort me by using stacking top pressure but it had no effect because my body was not flattened and I could breathe just fine even on the bottom. In the final seconds, as I felt he went tired and released his pressure, I switched to the full guard. He extended his arms trying to choke me, and I put a two-on-one on one of them and executed the armbar.